The American Hockey League All-Stars line up for the Canadian and American national anthems at the MassMutual Center. The American Hockey League All-Stars warming up. 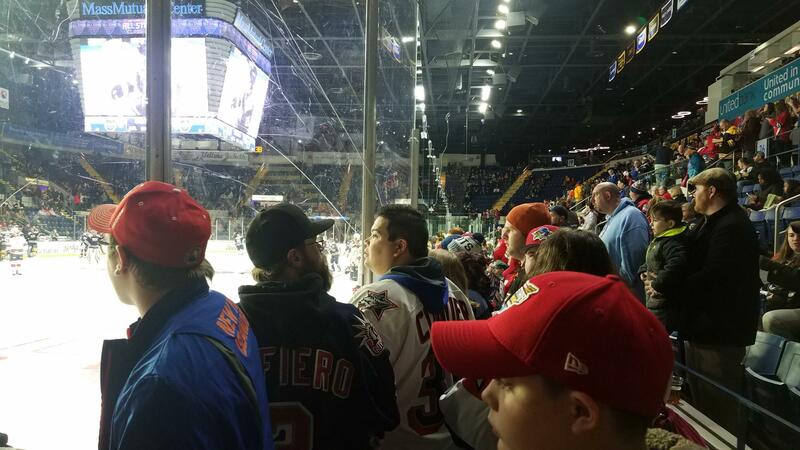 Fans line up along the glass to get a close-up view at the American Hockey League's All-Star Classic in Springfield Monday Night. Springfield Thunderbirds goaltender Sam Montembeault in net during the Atlantic All-Stars first game. The American Hockey League, which is made up by the top NHL farm teams, held its annual All-Star Classic in Springfield, Massachusetts, Monday before a sell-out crowd. Three years ago, such an event taking place in the city seemed unlikely, with Springfield’s team at the bottom of the league in attendance, and poised to move to Arizona. But a new team came in and is having much more success than its predecessor. 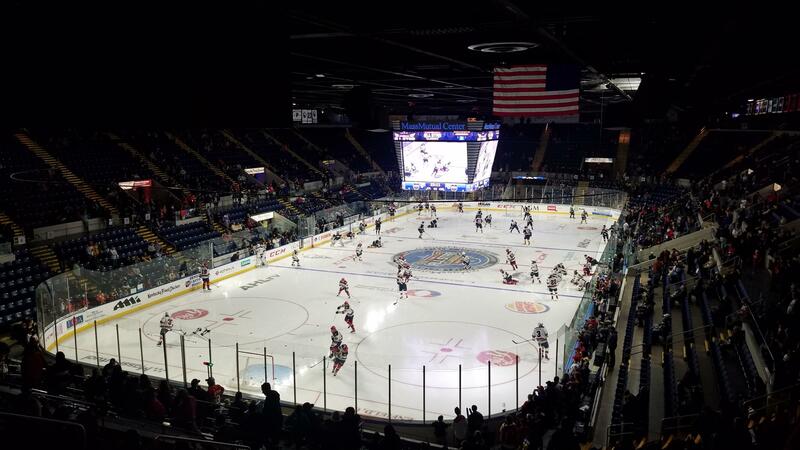 The Springfield Thunderbirds have been averaging at least 4,500 fans a game over the last three seasons. That’s far better than the previous team – the Falcons – were doing in their final years. "We're really trying to create moments that go beyond the sport, and that's what the best teams in the American Hockey League do, and they do well,” said Nathan Costa, the Thunderbirds' president, who credits his staff with helping to improve the fan experience and bolstering group ticket sales. And one person who’s noticed the difference is Steve Forni. He's an Agawam native who’s been the public address announcer at the MassMutual Center going back to the last days of the Falcons. "I always find it interesting, because there are some games where the team just really doesn't play well, and I'm sort of disgruntled," Forni said. "But you walk through the parking garage, and people are talking about how great of a time they had." Of course, Forni gets to watch from what he calls "the best seat in the house" — a glass-encased booth, at dead center ice, between the two penalty boxes. With hockey in Springfield now on much better footing, the AHL awarded the franchise the all-star game. Hundreds of fans lined up inside the arena lobby before the gates opened. Many sported their favorite hockey jerseys and apparel — from the NHL, the AHL and beyond. One young man who wore a bright red hometown Thunderbirds jersey was Chase Stebbins from Enfield, Connecticut, who was excited for the big night. "It's a special opportunity and I like it, and it's fun,” Stebbins said. Chase is an aspiring right-winger and said he'll be watching the players carefully. "I look at their feet and their movement, and it helps me out," he said. Another fan who was wearing a Thunderbirds jersey was Al Arment of Springfield, a season ticket holder. He says he was looking forward to maybe seeing some future stars. "The action on the ice is great, because you're seeing the best of the best," Arment said. "All those guys that are out there now are going to be up in the National Hockey League in the next couple of years, so it's really worth coming down to see." While the fans were making their way in, those players who hope to be stars someday were going through their final preparations. "It means a lot," said Sam Montembeault, the Thunderbirds goaltender, a 22-year-old from Quebec. He's a third-round draft pick of the NHL's Florida Panthers who was named to his first all-star team. "It's only my second year in the league, so obviously with all of the work you do, it's a good reward to be here and be part of playing against all the best players in the league," Montembeault said. "It's a good reward." Across the locker room, Montembeault's teammate, Anthony Greco, was sitting by his locker. The 25-year-old has been with the Thunderbirds for three seasons, and got a feel of the big-time in December. He was called up to play one game for the big-league Panthers before returning to Springfield. "Anytime you can go up [to the National Hockey League], you want to stay up," Greco said. "To kind of get a taste of it, and see what it was about, it's definitely motivating for the future." After the introductions and national anthems, it was time to play hockey — but this was different than your usual game. Teams representing each of the AHL's four divisions competed in a mini-tournament. Each could send three skaters and a goaltender to the ice, much the same as overtime in the regular season. There wasn't as much contact as usual, with fewer players, but it gave the athletes a chance to exhibit their skills to the fans, and to NHL clubs. And the North Division squad beat the Atlantic Division – which included the Thunderbirds — 2-to-1 to win the all-star title.